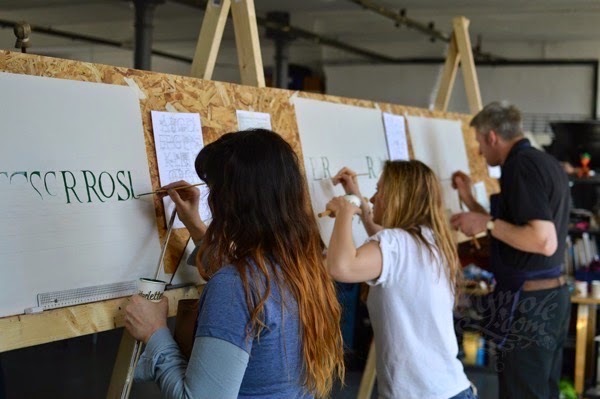 Inkymole: Signwriting with David Kynsaston. 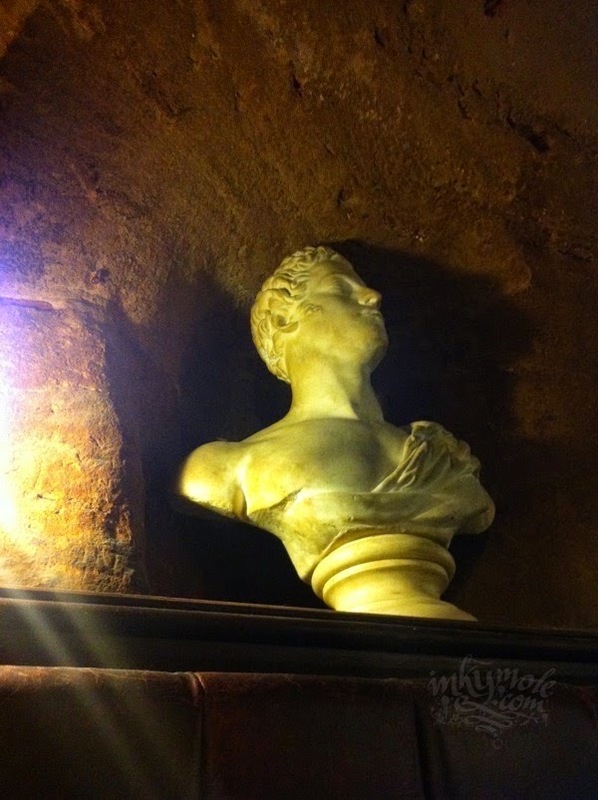 My weekend was spent at Waste Studios in Nottingham undertaking my first formal learning in ages. In recent years I’ve done segwaying, zipwiring, 4x4 driving; further back there was glassmaking, bee house making and even mask and fancy box-making, but those were nothing compared to this! We’d had a busy eighteen months which saw us painting a big mural in Baltimore at a moment’s notice, a future ghost sign on a local recently-restored pub and its interior, and a 15m wall mural, all completed on a heady mixture of gun-ho, improvisation, projection and the experience we already had. Somehow, we got those jobs done to the client’s total satisfaction and looking really nice. But with several more outdoor/wall/sign writing engagements coming up for the Inkymole Outdoor Division this year, I’d begun to feel keenly the lack of expertise in certain areas - there must be ways and means of doing more elegantly what we’d done, and better and more appropriate materials. 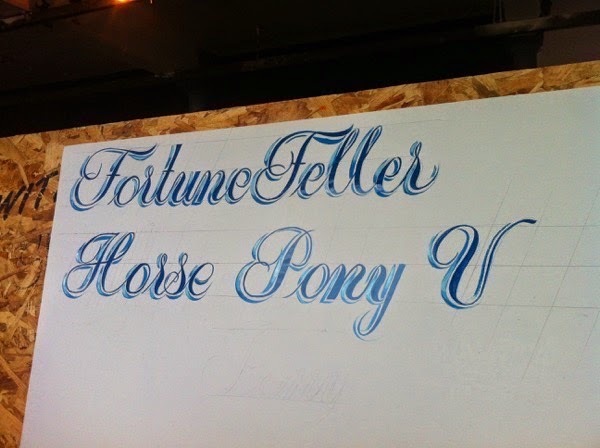 I’d kept an eye out for a signwriting course since the start of the year, and when this one came along, grabbed it. I’d forgotten what it’s like to be a beginner at something (I’ll get to experience this again when we go drifting next week!) and three important lessons came home with me from the weekend. Day One was Roman type. 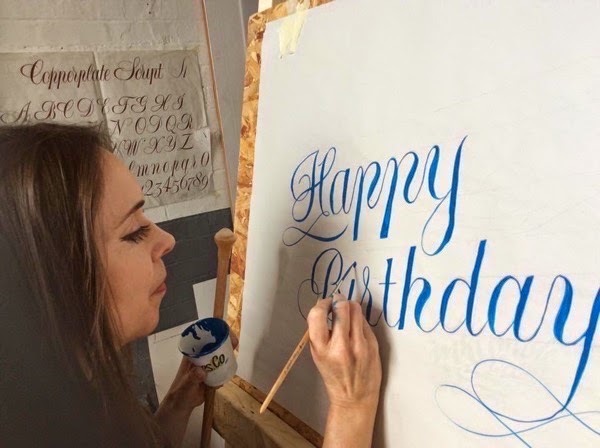 First, realising the crucial difference between a ‘script’ or a ‘hand’ - the style of lettering that a sign-writer created by hand is not the same thing as a typeface or a font - was the first big learning curve. 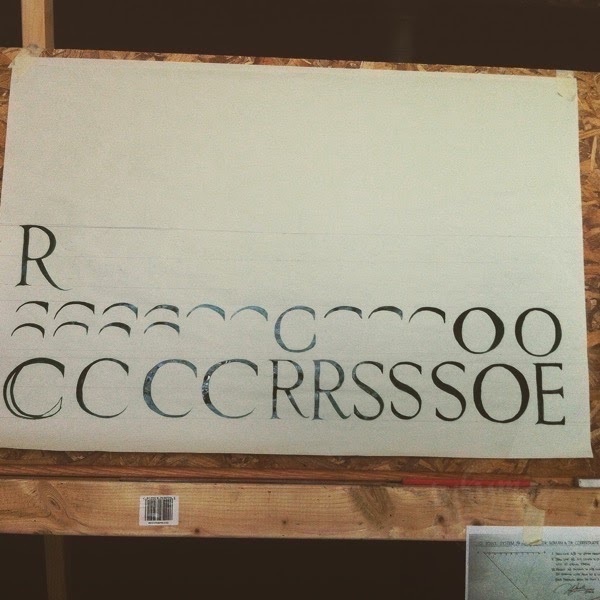 The Roman and Copperplate letter-forms I was pencilling out with tutor David Kynaston’s home-made angle tool are ancient characters which, although subject to certain rules and weights, are slightly different every time depending on who’s drawn them, at what size and on what substrate. In other words - aim for hand-drawn perfection, not mechanical accuracy. I was soon auto-correcting myslf every time I reached for the word ‘typeface’. Learning Curve no. 2 was the amount of maths involved in creating a single letter, a collection of which when spaced correctly (not kerned - spaced!) create a word. 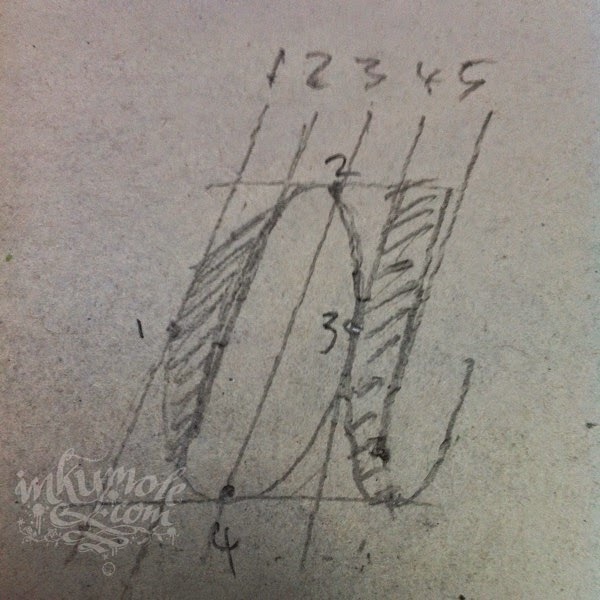 Often, the most I’ll pencil out for some type is a base line, maybe a top and centre line perhaps, but the consistent angled lines generated by measuring points were a new and slow procedure. 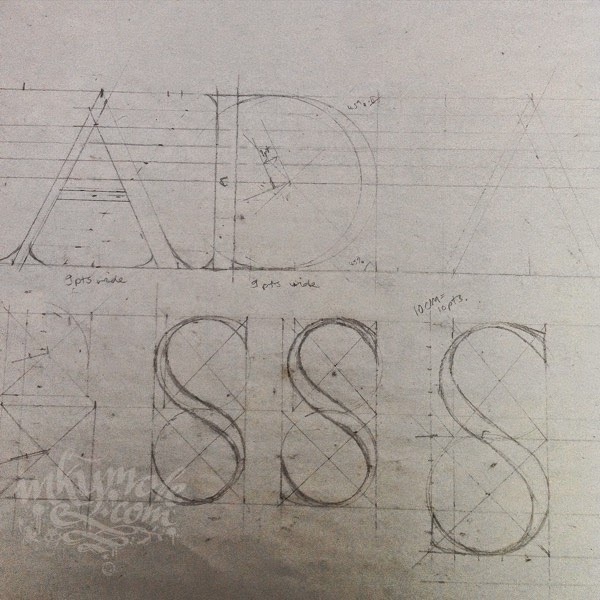 After two hours of drawing out letters using only a pencil, ruler and David’s special tool, and still not getting them quite right, I couldn’t help but think about how much type I’d have created in the same amount of time using my ink pens on paper. Nope - this is a very different way of working, but incredibly satisfying. There’s no ‘winging it’. 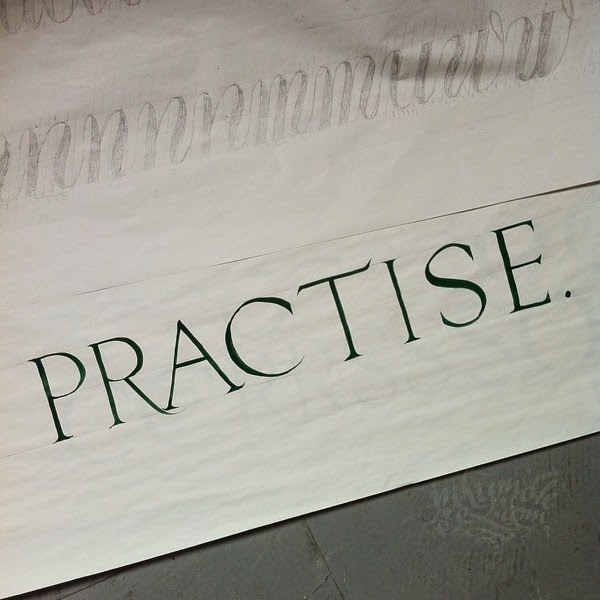 I usually only get to the labour intensive part of my lettering when I’m settled down with my pen and ink, but this was a reversal - measuring out took ages, but the letters themselves, when we were finally allowed some paint and a brush, emerged fairly quickly, a wobbly and uncertain stroke at a time. 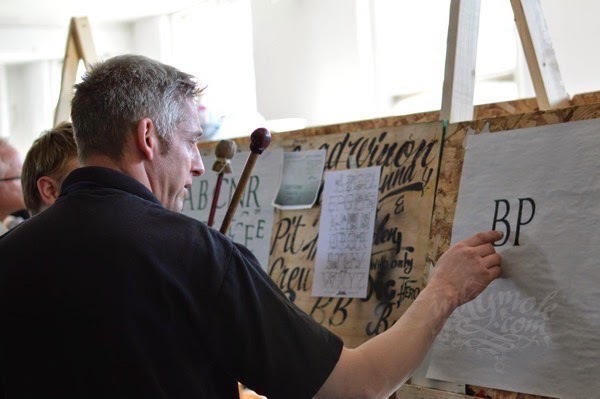 Watching Dave create his own letters freehand was an encapsulation of his 27 years of experience, and a reminder of what it is like to be on the other side of the many hours of teaching I’ve done: Lesson Number 3. 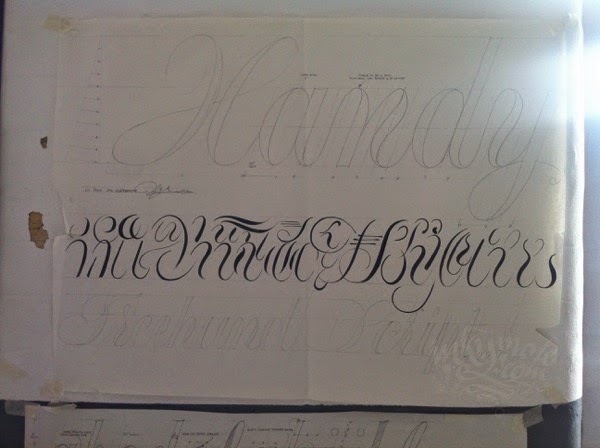 When I sweep a pen over a sheet of paper with apparent casual ease, it’s easy to forget that the person watching who’s never done it before might well be feeling they could never achieve that - just as I did when I watched Dave’s Massive Signwriting Hands pull beautiful Copperplate sweeps from thin air. I gulped back awe and intimidation with my half-aware sip of tea, and narrowed my eyes in determination. 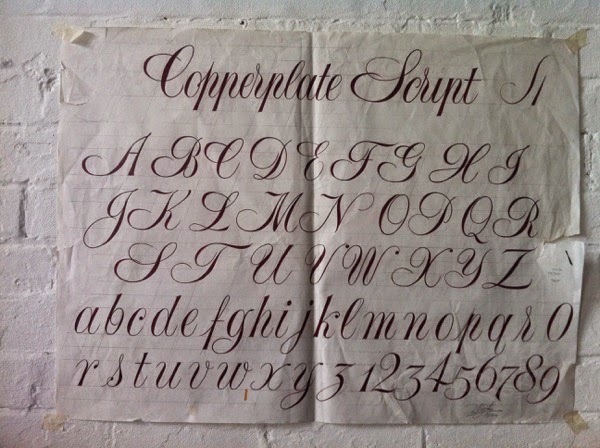 Copperplate I thought I’d be more comfortable with, but I still found there was a great deal of muscle memory in the right hand that wanted to sweep and add pressure where it wasn’t supposed to be for this script. 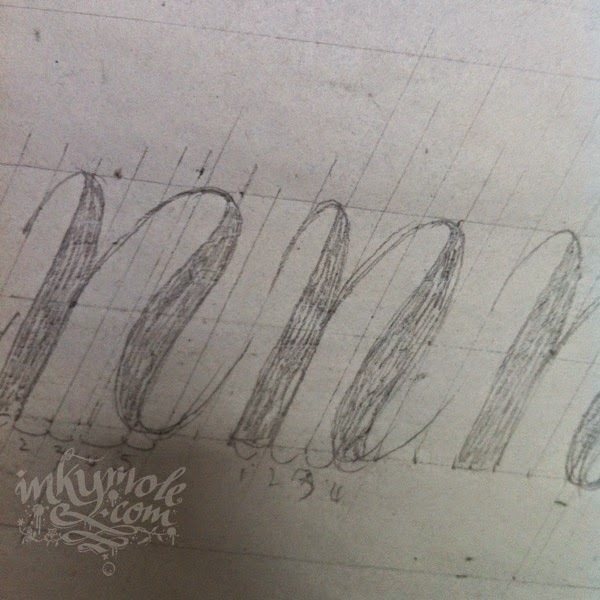 The key to an excellent Copperplate is to get your strokes absolutely consistent - fat ups, thin downs, and vice versa, and the thins are REALLY thin. 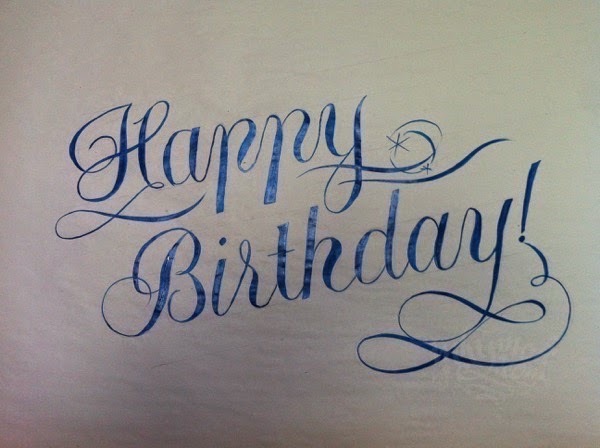 Today, un-learning seemed to be the key - ink pens need pressure, sign-writing brushes don’t, and working vertically changes everything. Again in the afternoon, aware I was missing a 3-year-old Coleman family member’s birthday party, I decided to make my final piece this. At this point, the concentration levels were at their highest! 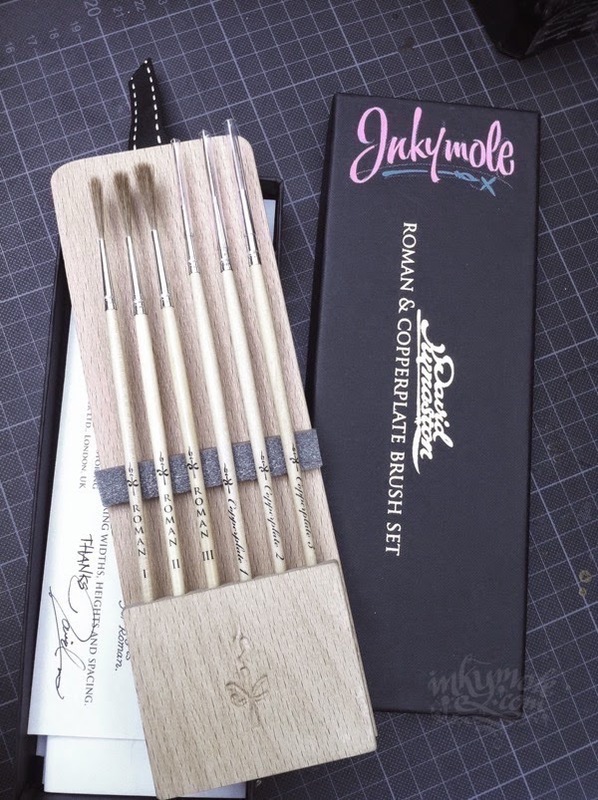 Finally I took home the set of proper signwriting brushes, made by Dave himself in his special home-made box, which he personalised with an easy swish of the pink paint. Well we do have actual proper signwriting to do very soon, and we need the proper gear, right? At the end of the weekend I was knackered, partly because I was standing up pretty much the whole time, but mainly because I was reminded of the fact that although the brain occupies only 2% of the body’s total mass, it uses up 20% of its energy. 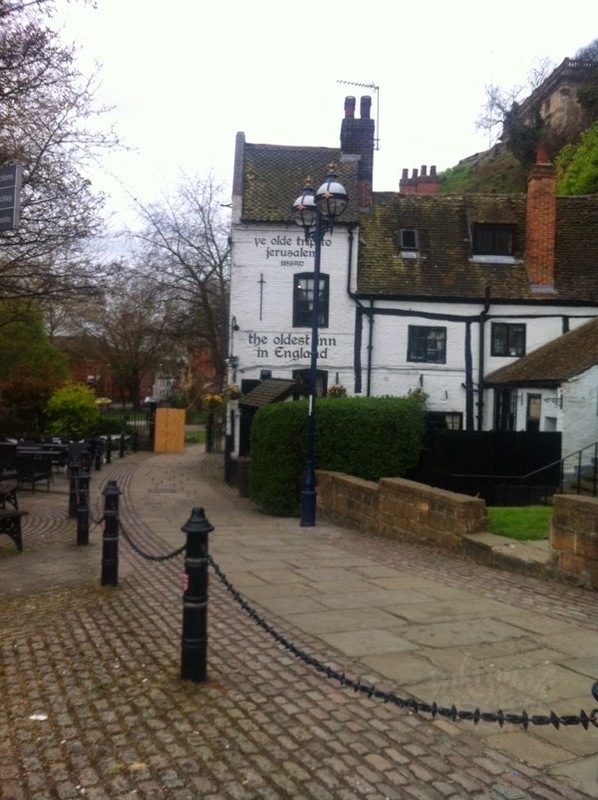 So, there was nothing for it but to sit down in the Oldest Pub In England with a half of dark porter and some crisps, under its roof carved from the inside of the rockface. I’ll definitely take the opportunity for another course if I can, as one was clearly only the very micro-beginning, and I need to, shall we say…brush up! Thanks Dave for an excellent two days at just the right pace, in a sunny studio.